UGC Chairman Prof Abdul Mannan speaks at a meeting between University Grants Commission (UGC) and four universities of the country at the auditorium of the commission in the capital on Monday. A meeting between University Grants Commission (UGC) and four universities of the country was held at the UGC auditorium in the capital on Monday. Prof Abdul Mannan, Chairman of the UGC, presided over the meeting, says a press release. 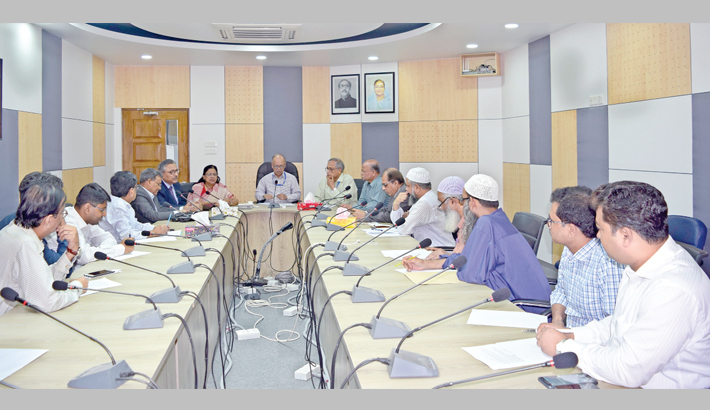 Prof Dr Mohammad Yousuf Ali Mollah, Prof Dr Dil Afroza Begum, Prof Dr Md Akhtar Hossain, members of the UGC, Prof Dr Saiful Islam, Vice-Chancellor of the BUET, Prof Dr M Anwar Hossain, VC of Jessore University of Science and Technology, Prof Dr MM Shahidul Hassan, VC of East West University, Dr Md Khaled, secretary of the UGC and representative of the University of Dhaka, among others, were present at the meeting. At the meeting, they discussed various issues about the proposed ADB project on IT parks for employment and innovation. The UGC chairman, in his speech, said the proposed project will play a significant role for country’s human resource development in IT sector. ADB wants VCs’ commitment to initiate the project and urged the university top management to start civil works as early as possible, he said. Under this project, the four universities will be able to produce quality graduates and contribute a lot to develop Bangladesh as a mid-level income generating country by 2021.